TV3 just had the Health Minister on concerned that the pig 'flu is being carried by school kids back from a trip to Mexico. Ministry of Health officials say there is no guarantee these students have the swine influenza, which is thought to have killed 81 people in Mexico, but they consider it likely. All precautions are being taken to allow for this. Mr Ryall said "I am advised 10 students have tested positive for Influenza A, and these results will now be sent to the World Health Organisation laboratory in Melbourne to ascertain whether it is the H1N1 swine influenza." H1N1 influenza is a subset of influenza A. With modern air travel bringing diverse populations into contact with each other so quickly this influenza strain could already be airborne. 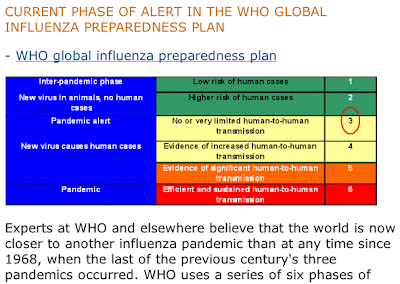 WHO is coordinating the global response to human cases of swine influenza A (H1N1) and monitoring the corresponding threat of an influenza pandemic. The world is presently in phase 3: a new influenza virus subtype is causing disease in humans, but is not yet spreading efficiently and sustainably among humans. 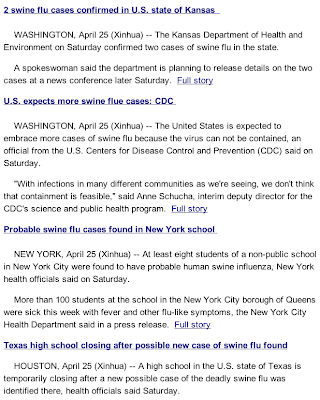 24 April 2009 -- The United States Government has reported seven confirmed human cases of Swine Influenza A/H1N1 in the USA (five in California and two in Texas) and nine suspect cases. All seven confirmed cases had mild Influenza-Like Illness (ILI), with only one requiring brief hospitalization. No deaths have been reported. The Government of Mexico has reported three separate events. In the Federal District of Mexico, surveillance began picking up cases of ILI starting 18 March. The number of cases has risen steadily through April and as of 23 April there are now more than 854 cases of pneumonia from the capital. Of those, 59 have died. In San Luis Potosi, in central Mexico, 24 cases of ILI, with three deaths, have been reported. And from Mexicali, near the border with the United States, four cases of ILI, with no deaths, have been reported. Of the Mexican cases, 18 have been laboratory confirmed in Canada as Swine Influenza A/H1N1, while 12 of those are genetically identical to the Swine Influenza A/H1N1 viruses from California. The majority of these cases have occurred in otherwise healthy young adults. Influenza normally affects the very young and the very old, but these age groups have not been heavily affected in Mexico. Because there are human cases associated with an animal influenza virus, and because of the geographical spread of multiple community outbreaks, plus the somewhat unusual age groups affected, these events are of high concern. 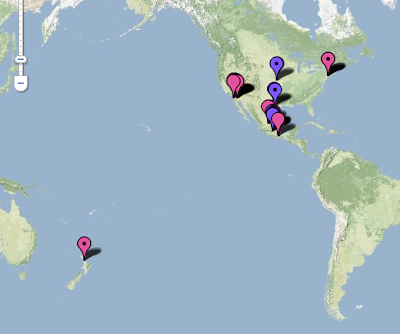 The Swine Influenza A/H1N1 viruses characterized in this outbreak have not been previously detected in pigs or humans. The viruses so far characterized have been sensitive to oseltamivir, but resistant to both amantadine and rimantadine. The British Airways crew member was taken to Northwick Park hospital in Harrow, northwest London, after flight BA242 landed at 2pm. “The patient was admitted directly to a side room and the hospital is scrupulously following infection control procedures to ensure there is no risk to any other individual in the hospital,” the hospital said. The Port Health Authority, the agency responsible for disease containment at the UK’s borders, is asking crew on flights into Britain from Mexico to report any passengers suffering from coughs and sneezes to medics. Avian flu, which has killed 250 people since 2003 and sparked the last pandemic threat, is caused by influenza viruses adapted to infect birds. 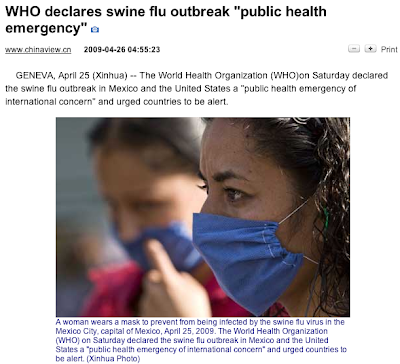 Swine flu is caused by viruses adapted to pigs. Big problems arise when human and animal flu viruses mix and mutate into new organisms that can spread through the population. The fact that most of the Mexican dead were aged between 25 and 45 rather than being elderly or very young is seen as a particularly worrying sign. The first victims of the Spanish flu pandemic of 1918 were also healthy young adults. The symptoms of swine flu in people include fever, fatigue, lack of appetite, coughing and sore throat. Michael Osterholm, a pandemic flu expert at the University of Minnesota, said new cases were probably already incubating around the world. Tamiflu, an antiviral drug used against bird flu, is said to be effective against the new strain. We had a case of SARs and the pandemic crew got into gear and stopped a nationwide out break. Birdflu almost became an international war. Sounds strong but don't be suprised if a war comes from a pandemic, closed boarders & isolation or an invasion to deal with the health requirements the neighbouring failed state can't or won't deal with. Remeber Israel has already had the first water war (or skirmish) & won that at the expense of her neighbours agriculture. What ever happened to those killer bees moving across from Mexico into the US? One of our sons ... aged 21 - is in NYC at present arrived there about 6 weeks ago - 2 weeks ago he was struck down with a 'flu which lasted about 3 days ...he's as strong as an ox and super healthy but he said he actually thought he was going to die. They became republicans, destroyed the party, and now spend their time between cabaret acts feasting on the sill living, but peutrasecent, body of Reagan's fake legacy. I thought everyone knew that. Does anyone talk about when it last broke out and that it was a military facility? Or has the mass vaccination of the US in 1976 and its damning effects on the public just been lost in time lines at news networks? Lets just hope there's no "vaccine" been pumped out for everyone this time, don't panic folks, lets think rational! Unanswered questions regarding the outbreak remain to this day. According to a CDC investigation, It is not known why the virus did not extend beyond basic trainees or beyond the military base. The source of the virus, the exact time of its introduction into Fort Dix, and factors limiting its spread and duration remain unknown. 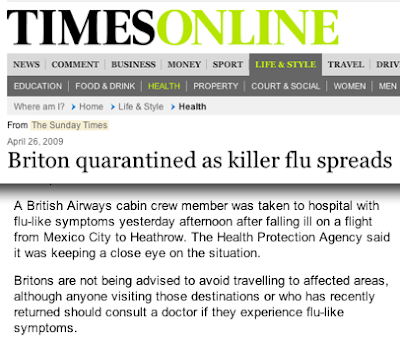 The Sunday Times story about the flight staff turned out not to be pig 'flu.